Say what you like about Bryan Hill, but he knows how to ratchet up the tension. 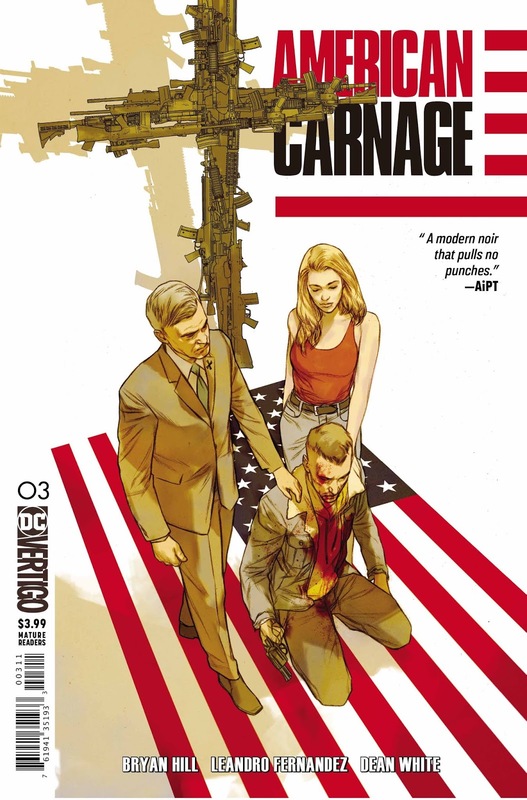 Last month's American Carnage ended with undercover white-passing mixed race FBI agent Richard Wright faced with an impossible decision. Tagging along with his new white supremacist buddies, Wright is confronted with a bound and gagged black man that the racists want him to beat up, seriously injure or possibly kill. How does he deal with this situation? Well, let's see, shall we? The first thing to point out is that Hill does not make this situation easy for Wright to resolve. In fact, he only survives it by the skin of his teeth and the tension does not dissipate quickly but builds and builds as things spiral horribly out of control. The black man is, allegedly, a drug dealer selling his wares to white girls, the intersection of race, criminality and traditional notions of masculinity as old and pervasive as it is powerful. Whether the bound black man is actually guilty of these allegations is unknowable and in some respects beside the point. Lynch mobs have never been especially strong on acting on evidence. In any case, although race is absolutely at the forefront of this, Hill is, I feel, more interested in what I suppose you could call the vectors of violence – how violence is innately unpredictable and chaotic, an unleashing of a power that invariably breaks free of human control. This is the case here. There is a (very tense) moment in which white supremacist Billy, having told Wright to break his prisoner's arm, points his handgun at Wright's retreating back. 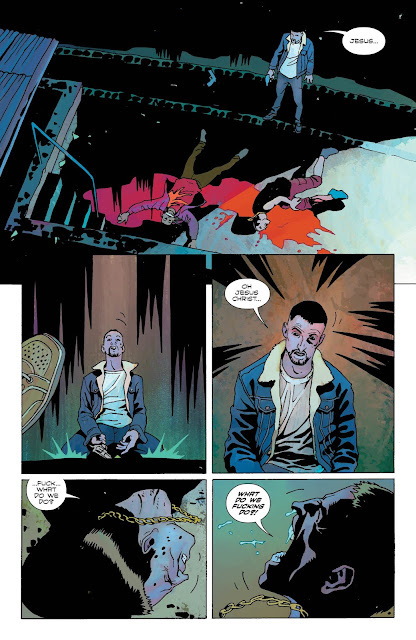 It is at precisely this point, in which Billy is attempting to exert control over Richard that he loses control of his prisoner and himself becomes a victim of violence. What follows is a fast-moving sequence of events in which the instinct for self-preservation leads to tragedy and a mess that inevitably needs to be cleaned up. Cue a phone call to the enigmatic Jennifer and, in arguably the issue's most disturbing and compelling scene, the subsequent arrival of a profoundly sinister man in a grinning Obama mask. 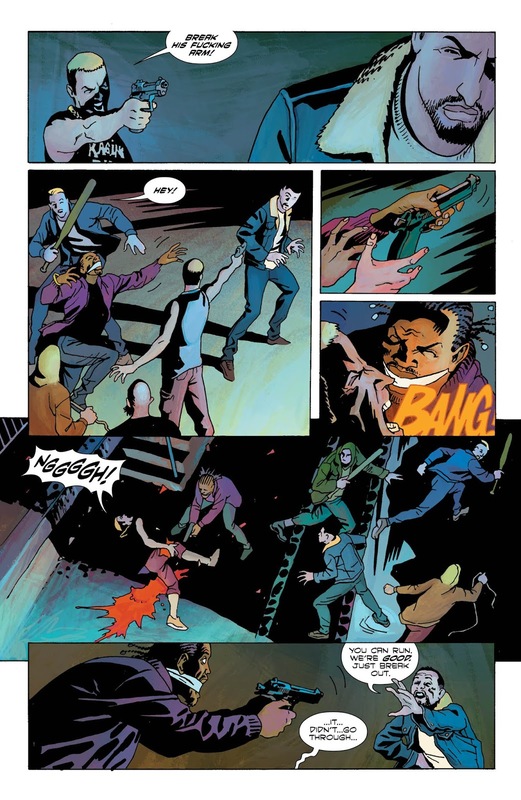 The issue ends with Jennifer's home being attacked. The two big scenes are interspersed with a series of flashbacks detailing Wright's recruitment as an undercover officer and some of the undercover cases he's worked. There's also a short interlude in which Wright's handler, Sheila Murray, is diagnosed with MS. If all of this sounds grim, well, it is. But it's no less compelling for all of that. Hill's writing is, at times, raw and very intense. While the issue is structured cleverly, it's safe to say that Hill avoids gimmickry and cheap narrative tricks. His story is too strong to need them and he is right to trust his instincts that it is best told in an unvarnished, relatively direct manner. Leandro Fernandez' art may not be to everyone's tastes, but it is emotionally expressive and sometimes extraordinarily visceral. Wright's anguish at the outcome of the confrontation with the young black man is raw (that word again!) and utterly convincing. 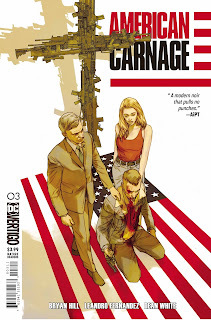 American Carnage is a book I can wholeheartedly recommend. Its extremely powerful storytelling hits hard and leaves plenty of food for thought in the process. A raw, profoundly compelling and distinctly unsettling slice of comic book action.